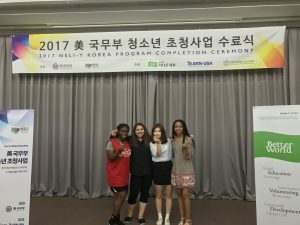 Danielle is from Miami, FL and is an alumna of the 2017 Korean summer program. Some of the experiences I valued most that the NSLI-Y program provided me with were instances where I was provided with the opportunity to teach someone something new, that they may have never been able to understand otherwise. 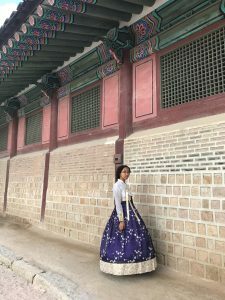 South Korea, a country I’d previously thought, as it was so technologically and economically forward, was a global society, similar to the U.S. in that knowledge about other cultures would be so easy to access, that everyone would be knowledgeable on even the slightest level about the diversity in our world. I’d had the notion that I wouldn’t be viewed as different because of my background in a completely foreign country. And even though this notion turned out to be untrue, never was I judged or discriminated against. Instead, because of my differences, many, especially my host sisters, were curious about every single inch of my being. Especially, my hair. With every moment in which someone didn’t understand something about me or wanted to know something about my background, I was given the opportunity to change an individual’s perspective on the world. 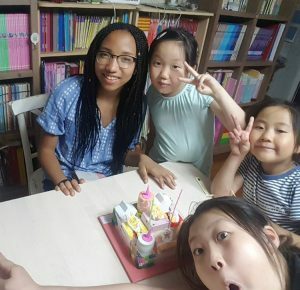 On the day I met my host family, even despite my anxiety and awkward exchange of Korean words, my two younger host sisters, who would become my best friends in my six weeks with them, were so fascinated with my hair that they didn’t even say anything other than “ 와, 인형 머리 같아 (Wow, your hair looks like a doll’s).” To this, I’d say I was confused, as I’d never really thought of my braids as even similar to that of a doll’s. Upon explaining how my hair was in that state, questions were coming up so fast that I could barely keep track. It seemed as if every lesson I’d learned about the 5 W’s (Who, What, When, Where, Why, How) was coming back into vision after 7 years of schooling. However, with the thought that no one else would be able to answer these questions as I could and the chance of them meeting another person with the same background as I could be quite low, I readily answered all questions. The most important lesson of what I’d learned was that people are always looking to learn more about others. However, the opportunity to do so may not always be present. Therefore, I’d taken it upon myself to really become a representative of my racial, ethnic, and even age group, in order to teach others lessons that maybe could be learned anywhere else, but couldn’t be truly understood without the actual input of a person. Of course, if I hadn’t told my host sisters that my hair was in fact not real, that it did not grow in the form of braids, that I could still wash my hair while it was braided, and that it does indeed hurt when one pulls on it, then from whom else could this be learned?